In a shaker half-filled with ice cubes, combine the gin (or Vodka), lemon juice, and sugar (or subst.). Shake well. Strain into a collins glass almost filled with ice cubes. Add the club soda. Stir and garnish with the cherry and the orange slice. In 1874, people in New York, Pennsylvania, and elsewhere in the United States would start a conversation with “Have you seen Tom Collins?” After the listener predictably reacts by explaining that they did not know a Tom Collins, the speaker would assert that Tom Collins was talking about the listener to others and that Tom Collins was “just around the corner”, “in a [local] bar,” or somewhere else near. 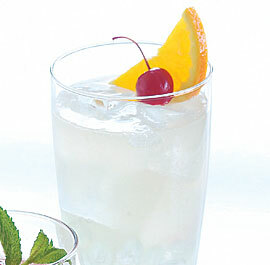 The conversation about the nonexistent Tom Collins was a proven hoax of exposure. In The Great Tom Collins hoax of 1874, as it became known, the speaker would encourage the listener to act foolishly by reacting to patent nonsense that the hoaxer deliberately presents as reality. In particular, the speaker desired the listener to become agitated at the idea of someone talking about them to others such that the listener would rush off to find the purportedly nearby Tom Collins. Similar to The New York Zoo hoax of 1874, several newspapers propagated the very successful practical joke by printing stories containing false sightings of Tom Collins. The 1874 hoax quickly gained such notoriety that several 1874 music hall songs memorialized the event.